The U.S. 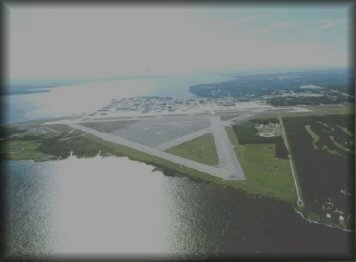 Naval Air Station Jacksonville has evolved from a relatively small training base into the hub of the Navy's third largest complex, right behind San Diego and Norfolk. It all started back in 1938 when a Congressional board visited Jacksonville looking for a suitable place to build a Navy base. Intense lobbying by the Jacksonville Chamber of Commerce persuaded Congress to pass, and President Franklin D. Roosevelt to sign into law on April 26,1939, a bill authorizing the aviation facility for Jacksonville. A $1.1 million bond issue was voted by the citizens of Jacksonville and Duval County, and in July 1939 the land at Black Point on the west side of the St. Johns River was purchased and given to the Navy. The land was given to the Navy had formerly served as an Army camp during World War I - Camp Johnston, and later a Florida National Guard camp - Camp J. Clifford R. Foster. Hastened by the war in Europe, construction began in late 1939 and the first pilot to land on the still-unfinished runway arrived Sept. 7, 1940. The base was officially commissioned on Oct. 15, 1940, with Capt. Charles P. Mason as the first command officer. Almost immediately, aviation cadets started arriving for training. By the time the United States entered the war, training was in full operation and by VJ Day, a total of 11,000 pilots and 10,000 aircrewmen had undergone training to earn their wings. Over 30,000 gunners were also trained. An impressive one million flight training hours were logged during the war years, with two take-offs and landings every minute on the average. Three runways over 6,000 feet were built as were seaplane and repair facilities that later became the Naval Aviation Depot. Near the end of the war, NAS Jacksonville became a Prisoner of War camp for about 1,650 German POW's. They were held on a small compound near the site where the commissary now stands. After the war, thousands of Navy men and women were discharged at a separation center here, and the Naval Hospital provided medical care for many who were wounded in the war. The first helicopter to land in Florida, an HNS, landed here on Nov. 28, 1944. The air station was the first home of the Navy's flight demonstration team - the Blue Angels - who gave their first public performance in June 1946 at Craig Field, a private airfield in south Jacksonville. For two years - from 1946 to 1948 - NAS Jacksonville was the headquarters for the Seventh Naval District. In 1948, the major mission of the air station had changed from training to the support of fleet units and in that year the post of Commander Fleet Air, Jacksonville, was established. COMFAIRJAX was the predecessor of today's senior command onboard, Commander, Naval Base Jacksonville. By 1949, half the Navy's aircraft on the East Coast were stationed in Jacksonville, at NASJAX and the Naval Auxiliary Air Station Cecil Field, 15 miles to the west. The early 1950's saw the establishment of patrol - VP - squadrons at the air station, with the mission of antisubmarine warfare, which remains the major mission of the air wings based here today. The Navy's Hurricane Hunters were mostly based at the station from 1953 until disestablishment in 1975. Today, the air station stands at the forefront of antisubmarine warfare readiness. Its two aviation wings - Patrol WING ELEVEN and Helicopter Antisubmarine WING ATLANTIC, which relocated to NASJAX in 1973 - fly the P-3 Orion long-range maritime surveillance aircraft and the SH-3 Sea King and SH-60 helicopters. NASJAX occupies 3896 acres on the St. Johns River and is home to 14,532 personnel and 68 tenant commands.